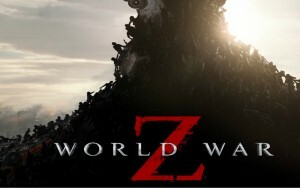 A well structured story was left on the back burner of the latest Hollywood apocalyptic zombie movie, ‘World War Z‘. Instead, we have a $200 million dollar action film that delivers on a few suspenseful situations as Brad Pitt is the one man to save the world from the sudden world-wide zombie epidemic. I imagine that with Brad Pitt starring in this zombie genre film, box office receipts will do well enough to compete with Pixar’s ‘Monster’s University‘, but might have a difficult time making ends meet with its mega budget and long list of production problems the project had over the last few years. Despite being rated PG-13, this movie about the undead will at times cause you to genuinely jump out of your seat, but those looking for a straight adaptation of Max Brooks’ (son of Mel Brooks and Anne Bancroft) novel of the same name will be surely disappointed. Brooks’ book was written as an oral history of the zombie apocalypse, detailing the start and aftermath of the zombie war. The book was styled as a series of interviews from different people around the globe and their accounts of the global epidemic, providing a social and religious commentary on the devastation. This is all left out of the film including some key plot points, such as in the book, it is clearly noted that this whole zombie outbreak started in China, whereas in the film, nothing is mentioned of where any of it began. ‘World War Z‘ is a classic case of Hollywood showcasing their muscles with epic action scenes to sell tickets rather than any coherent and decent storyline. We begin in downtown Philadelphia with retired United Nations detective Gerry Lane (Pitt), who is in his car with his wife, Karen (Mireille Enos) and their two young daughters. Stuck in heavy traffic, the zombie apocalypse hits downtown Philadelphia with a vengeance, and within a matter of seconds, 1000’s of people are now blood thirsty and incredibly fast-moving zombies. Gerry moves his family fast and calls his former boss Thierry (Fana Mokoena) to rescue him and his family from a nearby housing project rooftop and take them to a temporary refuge aboard several naval ships anchored in the Atlantic Ocean. Things move very quickly, and not in a good way. It seems like everybody’s first thought and first action is always the right one, and nothing is ever explained in full. For example, we never fully know why Gerry is the only man capable of stopping and solving the zombie outbreak, as it is never explained. However, Gerry is about to embark on a world-wide journey to find answers, and his first stop is South Korea where he meets a team of elite soldiers and scientists that are looking for solutions. Gerry only listens and follows the advice of a former operative who has been relegated to a prison cell for treason. This former operative informs him that North Korea has fixed the zombie outbreak by enforcing a mandatory tooth extraction from every citizen within a matter of 24 hours, but that he will find more answers in Israel. After a suspenseful attack, Gerry is off to Israel where the city of Jerusalem has erected a six-story concrete wall to keep out the undead. Inside this wall, life is back to normal, but as soon as Gerry arrives, the zombies somehow manage to climb the wall and destroy the city in a matter of minutes. This escape scene is pretty spectacular and frightening, even if aspects of it don’t make sense at all. But that seems to be the theme of the movie so far. During the escape, Gerry comes across a wounded female solider named Segen (Daniella Kertesz) who he takes on the last plane out of Israel, which his contacts aboard the naval ship tell him to head to Wales, where there’s a medical research facility still in tact. After a scary incident forces the plane to make an emergency crash landing, Segen and Gerry stumble upon the facility where the climactic finale takes place. This was the segment of the film that was re-written, re-shot, and re-edited many times over on a big budget. Gerry and Segen along with a couple of remaining scientists have to navigate the maze like research facility full of zombies to get a hold of a certain solution that could perhaps make a huge impact to put a stop in this zombie outbreak, which by now has engulfed most of the world’s population. These particular final moments are completely different and conflict with what we’ve seen previous to this moment, by way of adding a slow and suspenseful situation, rather than the high-octane action scenes that came before it. It’s not a wrong decision, just a strange one. And as if they had no more budget or time, everything is wrapped up very quickly in a vague matter, but not before Brad Pitt takes a long cool drink of a Pepsi. 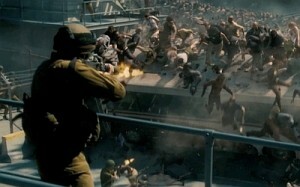 There are certain aspects to ‘World War Z‘ that work very well. The zombies themselves are fairly frightening. They turn instantly after being bitten, and seem to develop super strength and super speed to attack their prey. They hurl their bodies at full force, even off of buildings to attack. They twitch and move their bodies in ways that bodies aren’t made to move in. As heavy as this movie is on action sequences, one would hope for some pretty incredible action beats. Luckily for us, the filmmakers deliver that on a silver platter. Never before have we witnessed a zombie epidemic on this grand of scale. From the helicopter shots that show literally hundreds of thousands of the undead running for food and biting people whenever they get chance, to the intense zombie outbreak aboard a plane in mid-air, you are guaranteed to be on the edge of your seat. I only wish the filmmakers put this much effort in the characters and story. Pitt of course does an amazing job as the leading man here who is set on saving the world and is fully believable in such a position. The rest of the supporting cast aren’t A-listers, but still do the job and I think we would have been taken out of the whole experience if the supporting cast was full of academy award winners. Kertesz sticks out as the fresh face who does an amazing job and holds her own alongside Pitt. And for you gore fans, you will be sorely disappointed as there isn’t a drop of blood or any decent flesh-eating scenes in the entire flick. That being said, that makes this flawed zombie movie all the more suspenseful and scary. If I can say one thing that I enjoyed most about ‘World War Z‘, is that it was the first time since ‘28 Days Later‘, that I didn’t want or fantasize about being in a zombie outbreak type situation. Movies like ‘Shaun of the Dead‘ and ‘Zombieland‘ make it seem fun and a wild ride to be involved in this apocalyptic situation. But with this flick, I found myself scared to even think of this type of world-wide infection happening, and most of all, I didn’t want it to happen. Instead of seeing people kill zombies in unusual and creative ways, we mostly see people running from them and unable to defend themselves, even with the most dangerous weapons. It gave a realistic aspect that is all too horrifying. 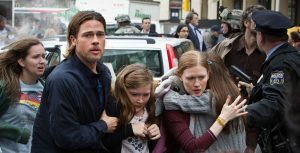 ‘World War Z‘ may not be the perfect story or character driven movie we wanted it to be, but its incredible action sequences and suspenseful situations deserve a look, despite all of its flaws. This entry was posted on Thursday, June 20th, 2013 at 11:44 am	and is filed under Film, News. You can follow any responses to this entry through the RSS 2.0 feed. You can skip to the end and leave a response. Pinging is currently not allowed.